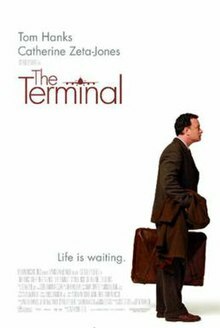 The Terminal is a 2004 American comedy-drama film co-produced and directed by Steven Spielberg and starring Tom Hanks, Catherine Zeta-Jones, and Stanley Tucci. The film is about an Eastern European man who becomes stuck in New York's John F. Kennedy Airport terminal when he is denied entry into the United States and at the same time cannot return to his native country because of a military coup. The film is partially inspired by the 18-year stay of Mehran Karimi Nasseri in Terminal 1 of Paris-Charles de Gaulle Airport, France, from 1988 to 2006. After finishing his previous film, Catch Me If You Can, Spielberg decided to direct The Terminal because he wanted to make another film "that could make us laugh and cry and feel good about the world". Due to a lack of suitable airports willing to provide their facilities for the production, an entire working set was built inside a large hangar at the LA/Palmdale Regional Airport, while most of the film's exterior shots were from the Montréal–Mirabel International Airport. The film was released in North America on June 18, 2004 to general acclaim and commercial success, earning $77.9 million in domestic grosses and $219.4 million worldwide. Viktor Navorski, a traveler from the fictional country Krakozhia, arrives at New York's John F. Kennedy International Airport, only to find that his passport is suddenly no longer valid. The United States no longer recognizes Krakozhia as a sovereign nation after the outbreak of a civil war, and Viktor is not permitted to either enter the country or return home as he is now stateless. Because of this, Customs and Immigration (a fictionalization of US Customs and Border Protection) seizes his passport and airline ticket. With no other choice, he settles in at the terminal with only his luggage and a Planters peanut can, much to the frustration of Frank Dixon, the temporary customs director for the airport. Dixon is being considered for a promotion and becomes obsessed with getting rid of Viktor. Meanwhile, Viktor befriends and helps airport employees and travelers. Among them, a flight attendant named Amelia Warren, whom he sees periodically and tries to woo, presenting himself as a building contractor who is frequently traveling. Viktor had been hired by an airport contractor and paid under the table after he impulsively remodeled a wall at a gate that was scheduled for future renovation. One day, Dixon pulls Amelia aside and questions whether she knows Viktor's true situation. Amelia confronts Viktor at his makeshift home, where he shows her that the Planters peanut can contains a copy of the "A Great Day in Harlem" photograph. His late father was a jazz enthusiast who had discovered the famous portrait in a Hungarian newspaper in 1958, and vowed to collect the autographs of all 57 of the musicians featured on it. He died before he could get the last one, from tenor saxophonist Benny Golson. Viktor has come to New York to do so. After hearing the story, Amelia kisses Viktor. After nine months, his friends wake Viktor with the news that the war in Krakozhia has ended. Amelia also asked her "friend"—actually a married government official with whom she had been having an affair—to get Viktor a one-day emergency visa to fulfill his dream, but Viktor is disappointed to learn she has renewed her relationship with the man during this process. Moreover, Viktor finds out that Dixon must sign the visa. Seizing the opportunity, Dixon threatens to cause trouble for Viktor's friends, most seriously by deporting janitor Gupta back to India to potentially face murder charges. Unwilling to let this happen, Viktor finally agrees to return home to Krakozhia. When Gupta learns of this, however, he runs in front of a plane as it taxies to the terminal, resulting in his deportation, effectively taking the burden off Viktor. The delay gives Viktor enough time to go into the city. Dixon tries to have his officers arrest Viktor, but they instead let him leave the airport. Viktor arrives in New York at the hotel where Benny Golson is performing and finally collects the last autograph. Then he gets in a taxi, telling the driver, "I am going home." Some have noted that the film appears to be inspired by the story of Mehran Karimi Nasseri, also known as Sir Alfred, an Iranian refugee who lived in Terminal One of the Charles de Gaulle airport, Paris from 1988 when his refugee papers were stolen until 2006 when he was hospitalized for unspecified ailments. In September 2003, The New York Times noted that Spielberg bought the rights to Nasseri's life story as the basis for the film; and in September 2004 The Guardian noted Nasseri received thousands of dollars from the filmmakers. However, none of the studio's publicity materials mention Nasseri's story as an inspiration for the film. The 1993 French film Lost in Transit was already based on the same story. In deciding to make the film, Steven Spielberg stated that after directing Catch Me If You Can, "I wanted to do another movie that could make us laugh and cry and feel good about the world.... This is a time when we need to smile more and Hollywood movies are supposed to do that for people in difficult times." Spielberg traveled around the world to find an actual airport that would let him film for the length of the production, but could not find one. The Terminal set was built in a massive hangar at the LA/Palmdale Regional Airport. The hangar, part of the U.S. Air Force Plant 42 complex was used to build the Rockwell International B-1B bomber. The set was built to full earthquake construction codes and was based on Düsseldorf Airport. The shape of both the actual terminal and the set viewed sideways is a cross section of an aircraft wing. Because of this design, the film was one of the first to use the "Spider-Cam" for film production. The camera, most often used for televised sports, allowed Spielberg the ability to create sweeping shots across the set. The design of the set for The Terminal, as noted by Roger Ebert in his reviews and attested by Spielberg himself in a feature by Empire magazine, was greatly inspired by Jacques Tati's classic film PlayTime. Hanks based his characterization of Viktor Navorsky on his father-in-law Allan Wilson, a Bulgarian immigrant, who according to Hanks can speak "Russian, Turkish, Polish, Greek, little bit of Italian, little bit of French", in addition to his native Bulgarian. Hanks also had some help from a Bulgarian translator named Peter Budevski. Everything functioned in the set as in real life. There was real food, ice cream, and coffee in the appropriate outlets. The escalators were purchased from a department store that had gone bankrupt. Each of the outlets featured in the concourse building was actually sponsored by the real company. Many stores are seen and Viktor seeks a job at the Brookstone, La Perla and Discovery Channel stores, eats at the Burger King, buys his New York City guide book at Borders and buys his suit at Hugo Boss. Enrique proposes to Dolores at Sbarro. Most exterior shots and those featuring actual aircraft were shot at Montréal–Mirabel International Airport: additional interior shots were also done there including the mezzanine overlooking the immigration desks and the baggage carousels directly behind them, the jetways showing Aéroports de Montréal signs, and many Air Transat planes in the background: New York is not one of their regular destinations. Additional pre-production shooting was done at Los Angeles International Airport and at Spielberg's offices at DreamWorks. Montreal is also mentioned on the loudspeaker at the beginning of the film, around the point where the customs officer tells Viktor to wait in a special line. The 747 was provided by United Airlines. The Star Alliance was a major sponsor and provided uniforms, equipment, and actors in addition to those cast. In spite of the heavy presence of the Star Alliance airlines, a Delta Air Lines pilot passes Viktor in a scene during the last five minutes of the film. The clarinet piece, "Viktor's Tale", also composed by John Williams, is taken from the movie's soundtrack. Emily Bernstein recorded the clarinet solos for the score. Director Steven Spielberg - a former clarinetist himself - insisted that Bernstein's name appear in the film's end credits, although traditionally, individual musicians performing in studio orchestras remain anonymous. Rotten Tomatoes reported that 61% of 203 sampled critics gave The Terminal positive reviews, with a rating average of 6.2/10. The website's critical consensus reads, "The Terminal transcends its flaws through the sheer virtue of its crowd-pleasing message and a typically solid star turn from Tom Hanks." At Metacritic, which assigns a weighted average score out of 100 to reviews from mainstream critics, the film received an average score of 55 based on 41 reviews. Michael Wilmington from the Chicago Tribune said "[the film] takes Spielberg into realms he's rarely traveled before." A. O. Scott of The New York Times said Hanks' performance brought a lot to the film. Roger Ebert of the Chicago Sun-Times gave The Terminal three-and-a-half out of four stars, stating that "This premise could have yielded a film of contrivance and labored invention. Spielberg, his actors and writers... weave it into a human comedy that is gentle and true, that creates sympathy for all of its characters, that finds a tone that will carry them through, that made me unreasonably happy". Matt Zoller Seitz considers The Terminal, War of the Worlds, and Munich, the latter two also directed by Spielberg, as "the [three] best 9/11 films made in the studio system" despite the three not directly acknowledging the event "until the very last shot of [Munich]". The film grossed $77,872,883 in North America and $141,544,372 in other territories, totaling $219,417,255 worldwide. Krakozhia (Кракозия or Кракожия) is a fictional country, created for the film, that closely resembles a former Soviet Republic or Eastern Bloc state. The exact location of Krakozhia is kept intentionally vague in the film, keeping with the idea of Viktor being simply Eastern European or from a former Soviet Republic. However, in one of the scenes, a map of Krakozhia is briefly displayed on one of the airport's television screens during a news report on the ongoing conflict and its borders are those of the Republic of Macedonia, but in another scene the protagonist shows his driving license, which happens to be a Belarusian license issued to a woman bearing an Uzbek name. The film presents a reasonably accurate picture of the process of naturalistic second-language acquisition, according to professional linguist Martha Young-Scholten. John Williams, the film's composer, also wrote a national anthem for Krakozhia. Tom Hanks’ character speaks Bulgarian language as its native Krakozhian. ^ a b Gilsdorf, Ethan (June 21, 2004). "Behind 'The Terminal,' a true story". The Christian Science Monitor. Retrieved December 5, 2010. ^ Matthew Rose, "Waiting For Spielberg", The New York Times, September 21, 2003. Retrieved June 12, 2008. ^ Berczeller, Paul (September 6, 2004). "The man who lost his past". The Guardian. Retrieved May 5, 2007. ^ Total Film (September 1, 2004). "The Total Film Interview - Steven Spielberg". GamesRadar+. Future plc. Retrieved March 16, 2018. ^ "Tom Hanks' character in The Terminal speaks Bulgarian", YouTube. ^ "The Terminal (2004)". Rotten Tomatoes. Flixster. Retrieved December 5, 2010. ^ "The Terminal reviews". Metacritic. CBS Interactive. Retrieved December 5, 2010. ^ "Flight of fancy", Chicago Tribune, June 18, 2004. Retrieved January 1, 2016. ^ A. O. Scott, "Movie review: An Émigré's Paradise Lost and Found", by The New York Times, June 18, 2004. Retrieved January 1, 2016. ^ Ebert, Roger (June 18, 2018). "The Terminal Movie Review & Film Summary (2004)". RogerEbert.com. Ebert Digital LLC. Retrieved August 19, 2018. ^ Matt Zoller Seitz [@mattzollerseitz] (June 28, 2016). "That, WAR OF THE WORLDS and THE TERMINAL are the 3 best 9/11 films made in the studio system, all by the same guy" (Tweet). Retrieved August 19, 2018 – via Twitter. ^ Matt Zoller Seitz [@mattzollerseitz] (April 1, 2018). "I keep saying I'm going to write a piece about how THE TERMINAL, WoTW and MUNICH are the 3 greatest American films about 9/11 even though none of them actually mentions it until the very last shot of the last film" (Tweet). Retrieved August 19, 2018 – via Twitter. ^ Young-Scholten, Martha. "Hollywood: smarter than you think? Maybe". Archived from the original on July 27, 2011. Retrieved December 25, 2007. Abstract for talk given at the University of Leeds Department of Linguistics and Phonetics, April 26, 2006.